Have you heard of The Fashionable Housewife? 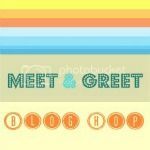 This is a fabulous blog that caters to us fashion conscious, non elastic waistband Moms! Btw, I have nothing again elastic waistbands, but they should never be in a pair of jeans, lol! If you are looking for some cool fashion inspiration for yourself, your children, your home, etc. then head on over. They have many different "divisions" such as The Fashionable Bambino, The Fashionable Gal, The Fashionable Plate, The Fashionable Philosopher and Fashionable Holiday. 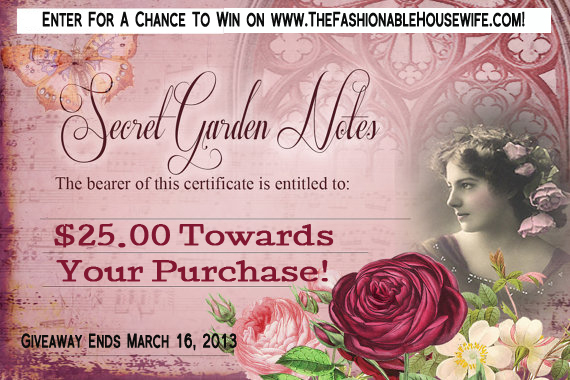 Right now they are having a free giveaway for a chance to win a $25.00 gift certificate to my Secret Garden Notes shop on Etsy. In fact, you have 10 chances to win as I am giving away 10 free gift certificates through their site. So grab a cup of coffee, a glass of wine, or whatever your prefer, and sit and stay awhile on their site, you won't be disappointed!